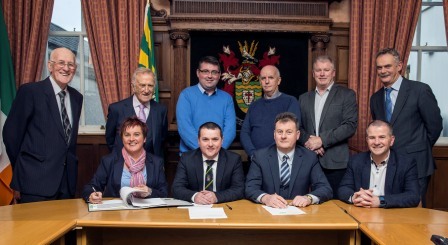 Signing of contract for the new Social Inclusion and Community Activation Programme (SICAP) 2018 – 2022 in the County House in Lifford on Monday is front row l to r: Shauna McClenaghan, Inishowen Development Partnership, Cllr Martin McDermott, Donegal LCDC, Seamus Neely, Donegal County Council and Liam Ward, Donegal County Council. Back row L to R Dermot McLaughlin, Inishowen Development Partnership, Jim Slevin, Donegal Local Development CLG, Paddy Doherty, Donegal County Council, Liam McElhinney, Donegal LCDC, Peter Walker, Donegal LCDC and Andrew Ward, Inishowen Development Partnership. IDP are delighted to have secured the Social Inclusion & Community Activation Programme (SICAP) for Inishowen for the next 5-year period. The contract for the new Social Inclusion and Community Activation Programme (SICAP) for the five year period 2018-2022 was officially signed on Monday at the County House in Lifford.